Much has been said and written about religion in Eritrea and various accusations have been hurled at the Government and people of Eritrea over the last decade. I believe it is time once again to re-visit the issue of “religious freedom” in Eritrea and how this “wedge issue” was hatched and why Eritrea was targeted. While the regime in Ethiopia may have contributed, by way of lies and disinformation, to the campaign to demonize the Eritrean leadership, the scope of the agendas seem to be much larger than anything the aid-dependent minority regime could ever muster on its own. A beggar regime whose national budget is donor subsidized and whose people are dependent on food aid, and whose institutions of government are externally funded and run, neither has the financial or intellectual capacity, to launch or sustain such a campaign. It was also a campaign that the so-called Eritrean opposition (a dubious association of like-minded defectors, disgruntled diplomats, pedophiles, rapists, self-professed “intellectuals and professionals” and an assortment of scandalous opportunists), who I have baptized as Eritrea’s Quislings League (EQL), could never organize or lead without directives. After overcoming almost three decades of betrayals and untold suffering, the neocolonialists should have been hard pressed to find a single EritreanChalabi[i]…but as we have seen in the last decade, Eritrea too has her share of treasonous children and scholars-for-hire… Instead of defending the dreams and aspirations of the Eritrean people, they set out to advance that of others. The EQL set out to betray the trust of the Eritrean people. Serving as puppets for the minority regime in Ethiopia; they undermined, ridiculed and sullied every Eritrean institution. They left no stone unturned to isolate Eritrea and deny Eritrea and its people the right to development. They burned the midnight oil churning out “analysis”, “reports”, “lists” etc. to malign Eritrea, its people and its leadership. Even the historical Eritrean Orthodox Church was challenged and its members rebuked. As we will see later, the Eritrean Orthodox Church was long targeted and the EQL, instead of defending the rights of the Church, worked in tandem with its enemies to distort its history and its foundation. Today, we see a member of the EQL is parading “In Chains for Christ”-how fitting for someone who have been unable to unchain himself from mental slavery…this from a man who had the audacity to preach to others about African decolonization. So, if it not the minority regime in Ethiopia and if not the EQL, then who was running the show? Well, suffice it to say that it too was an equally dubious alliance of fundamentally different and even ideologically opposed religious and political factions. One was the coalition of evangelical Christians (also known as the New Christian Right) and other was the aggressive political ideologues commonly known as the Neoconservatives. Despite their many ideological, cultural, and socioeconomic differences, these two factions found common ground in Bush White House and they, like Machiavelli back then, recognized the power of religion as a potent political tool. The cartel used civil religion to justify, promote and effectuate its political goals. They introduced us to a new brand of politics coined “Political Fundamentalism”[ii]-which has been defined as the “strategic manipulation of religious beliefs, narratives, and sentiments for political gain at home and for aggressive militarism overseas”. I will henceforth refer to them as the cartel. With a variety of mercenaries in tow, the cartel, which controlled the purse and the agenda, launched a massive disinformation and vilification campaign against the State of Eritrea. Eritrea’s Chalabis, expert information launderers that they have become,were eager to peddle countless lies and exaggerations about Eritrea’s history, economy, and its leadership and people-especially the Eritrean Diaspora. After jumping on the “democracy” and “human rights” bandwagons in the early years, the confused and disoriented EQL lined up to push the “religious freedom in Eritrea” wagon, while the cartel rode high. They figured it would be the most divisive issue, and the one that could help them achieve their ultimate goals. In these circles, treason and deceit are commonplace and there was plenty of that. Eritreans endured an incessant barrage of distortions, fabrications and insults from self-righteous individuals and groups. The cartel which enjoyed unprecedented access and power in the Bush Administration, is seeking to do the same with the new Barack Obama Administration. With individuals strategically placed in key Washington institutions such as Freedom House, the US Commission on International Religious Freedom, Institute on Religion and Public Policy, Open Doors, World Wide Evangelicals, Christian Solidarity Worldwide and in the United States Congress, the “network” managed to pass legislation during the Bush era, that should have not seen the light of day in an Obama Administration…that does not mean that they will not try… and some already have…and unfortunately some have succeeded. Not surprisingly, Meles Zenawi is not the first brutal dictator that the cartel has defended; their hands are soaked with the blood of thousands of innocent people all over the world. Throughout the Cold War years, these groups have been responsible for helping to get these dictators into power and then provided the diplomatic and political shield and support to stay in power. Some examples of such dictators who enjoyed the cartel’s support are Mohammed Suharto of Indonesia, the most brutal and corrupt of the 20th century, Haiti’s Papa Doc Duvalier, Guatemala’s General Rios Montt, Siad Biarre of Somalia. But Rios is not the only dictator that has won the support of Robertson and the cartel. Mobuto Sese Seko also benefited from his close friendship with Pat Robertson. He then, like Meles Zenawi today, was portrayed by Robertson as a “loyal US ally” in the war against international communism. He also emerged as Mobutu’s close friend, and probably his most valuable asset in a deceptive campaign to maintain his stature with some ruling circles in the United States. Robertson was “wined-and-dined” by Mobutu on the dictator’s presidential yacht, and entertained at his lavish estates. Robertson was rewarded handsomely for his political support and shield. He received extensive lumber and mining concessions along the upper Zaire River and operated a 50,000 acre farm in Zaire (now Congo). Pat Robertson is not the only member of the cartel that has provided diplomatic and political, shield and support for vicious and criminal regimes that have committed historical crimes against humanity. No one should forget the support given by Jerry Falwell for the apartheid regime in South Africa. In the 1980s, the leaders of the unashamedly pro-free market economics and anti formal religion cartel had invested heavily in apartheid South Africa. Believing that the African liberation struggles would bring an end to their free reign over the territories, they demonized the liberation struggle and its leaders. Many were forced into exile, many more were killed. Back then it was “the fight against communism”, that served as a pretext for their “unholy” alliances. They said that South Africa was “the Kremlin’s Playground” and that its leaders were “Marxist”. Desmond Tutu, Beyers Naudé, and Allan Boesak were portrayed as dangerous “foes” and Nelson Mandela was labeled a “terrorist”. Ted Haggard, one of the nation’s most influential conservative “Christian” leaders and a staunch ally of the Bush administration, who in a recent letter to his congregation confessed that he was “a deceiver and a liar” and cited “sexual immorality” as the reason for resigning from his position as President of the National Association of Evangelicals and as pastor of his Colorado mega-church (14,000-member congregation), once claimed that Jesus wants a free market economy. Today we see the cartel and its mercenaries employing pretty much the same propaganda techniques to demonize the Government of Eritrea and its leadership. Damning pictures and words have been replayed in thousands of missionary sites by the cartel for over 5 years. Pat Robertson’s 700 Club and the many hundreds of radio programs such as Compassion Radio, and hundreds of website have disseminated un-Christian propaganda. These lies have been regurgitated by young and old Americans; some of these people do not even know where Eritrea is, but chose to propagate the lies and deceptions, forgetting God’s commandments that clearly say, “thou shall not bear false witness against thy neighbor” and “thou shall not lie’. Toeing the line is a group of cheap imitators who insist on being “In Chains for Christ”. These individuals and groups call on prayers for others when it is obvious that it is them who need prayer and salvation the most. This member Voice of the Martyrs (VoM) maliciously labeled the Government of Eritrea “Communist” and falsely claimed that “the Eritrean security was trained by the East German Stasi, who were experts at recruiting informers from within religious groups”[iv]. Had he known anything about Eritrea’s long and heroic struggle for independence, he would have known that the East German’s never supported the Eritrean peoples struggle and never trained any members of the Eritrean People’s Liberation Front (EPLF). Glenn Penner knowingly misled his readers. Instead of doing his homework, he chose to “cut and paste” unsubstantiated reports from dubious sources such as Release Eritrea. For people like him, it is the sound bites that he chases, not the truth. 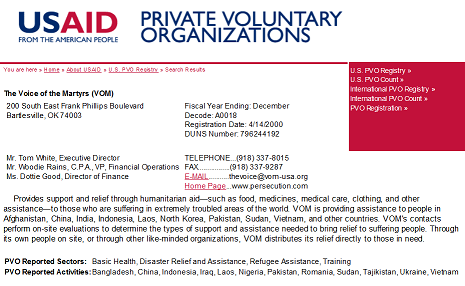 The fundamentalist and evangelical groups, such as VoM, preyed on the sympathies and kindness of the American public while and fleeced it of millions in donations and contributions, solicited on behalf of the “persecuted”. But he is not the only person at VoM that has fabricated lies and distorted the truth to hoodwink his readers and hide VoM’s lawlessness. Todd Nettleton is another member of that NGO who has engaged in the most vicious campaign designed to distort Eritrea’s image. He is one of the many individuals and groups missionaries who have abused Eritrea’s visa regulations and entered the country under false pretexts citing tourism or business (English teacher) as reasons and then extending their stay repeatedly to carry on missionary and proselytizing activities. Unfortunately, Eritrea is not his sole victim; there have been many other nations that have been violated by this wayward “missionary”. He justifies his illegal entry into sovereign nations and his lawless activities by saying that he is doing it for the good of the “converts”…he traverses the globe and tells us that if people are not introduced to the Gospel, “the alternative is that they will go to hell”. The alternative is that there will not be conflicts and violence and therefore no persecution stories for his group to peddle. For Nettleton and his group, its not just Moslems that are targeted, but as we shall see later, it is the established churches, such as the Eritrean Orthodox Church in Eritrea and the Ethiopian Orthodox Church in Ethiopia, that are prime for “harvest”. Then there is the audacious Kevin Turner, a USAID subcontractor that entered Eritrea pretending to be a “humanitarian” worker, who had no qualms insulting the people and government of Eritrea, while he was still in Eritrea. Probably felt that his USAID credentials gave him free reign in Eritrea, as it did in Sudan where he has been “converting Moslems” for over 14 years. Turner of Strategic World Impact (SWI) tells an unlikely tale about a dream in which Jesus Christ told him that there were 9 hot spots in the world that he needed to go to and do God’s work. By coincidence, they also nicely aligned with those countries that are of strategic political and economic interest to the cartel leaders. The scandal ridden-cartel that brought us the illegal detentions of Guantanamo Bay, the prisoner torture and abuse of Abu Ghraib, extraordinary renditions and secret prisons all over the world, including Ethiopia, and the fake National Endowment for Democracy (NED) and National Democratic Institute (NDI) sponsored multi colored and scented revolutions such as: Orange Revolution in Ukraine, Rose Revolution in Georgia, Cedar Revolution in Lebanon, Purple Revolution in Iraq, Saffron Revolution in Myanmar (Burma) and fake elections such as the 2005 elections in Ethiopia and the bloody Kenyan election of 2007, did not have the moral or legal authority or integrity or credibility, to preach to Eritrea about anything, least of all religious freedom. The recent Hindu attacks on Christians in the east and south of the country where churches homes and schools belonging to Christians were burned down and 22 people were killed and thousands forced to camps is yet another example. In this case, Christians in the area were “forcibly converting Hindus to Christianity”. The report cited a rise in “prosperity and status” that accompanies conversion to Christianity as being the underlying reason. In March 2008, the Jordanian government deported an unspecified number of expatriates for “carrying out Christian missionary activities under the guise of charity work”. Jordan, where Jesus Christ was baptized and is also home to several tombs of the Prophet Mohammed’s companions and Mount Nebo, and where according to biblical tradition God showed Moses the Promised Land, is a popular destination for Christian, Muslim and Jewish pilgrims alike who revere Moses. 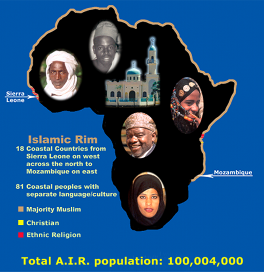 Imagine the fit the bigoted self-righteous cartel would have if 6000 Moslem Kenyan Missionaries came to live in their midst, to convert their children, wives, husbands, fathers and mothers to Islam and convert their Mega Churches to Mega Mosques or as they are doing in Africa, break them up into many “house Mosques” or “Islamic cells”. Yet, when countries introduce laws to protect their people’s peace and security from the cartel and the aggressive militancy that is engaged in religious expansion, “harvesting believers”, creating “underground churches” and “Christian cells”, they are labeled “draconian”, “anti-Religious Freedom” etc. etc. These groups go out of their way to provoke governments, but are the first to cry “foul” when governments act. What hypocrites! To its Bretton Woods “structural adjustments programs”, the cartel now added the Bible belt’s “spiritual adjustment programs” to maintain its economic stranglehold on Africa and its vast mineral, oil and other natural resources. By the time George Bush came to the White House, the Project was already at its height in places such as India, Burma and in African countries such as Ethiopia, Kenya, Nigeria, and Cameroon. In Eritrea, the Afar, Beja, Bilen, Kunama, and Saho were considered the “un-reached” and missionaries eyed the newly independent nation. In addition, during Eritrea’s 30-year long struggle for independence, Christians and Moslems lived and fought together to liberate Eritrea. Even though there were efforts to disrupt and divide the people between ethnic and religious lines, these efforts were immediately recognized and thwarted. So what is the problem today? 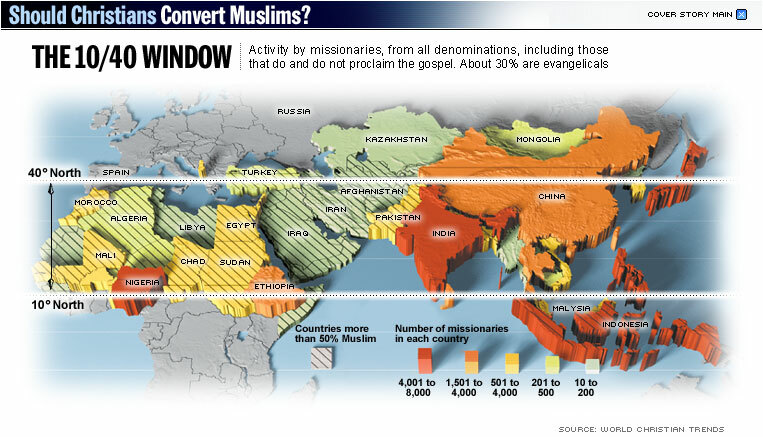 For that, I think it is easier to take a look at how these new churches are being established and what their goals are. We will take a look at one of the churches that was established in the early 40s and one that was formed in the 60s. I chose these two because the missionaries involved with these two churches have written extensively about them, making it easy for me to illustrate the problem. Just because the churches were established way before Eritrea’s independence doesn’t mean that they are good for Eritrea, or that they ever had the best interests of the people of Eritrea, as one shameless Eritrean scholar-for-rent suggested in one of his recent posts. The Burkina Faso fellowship formed in 1944 and is the largest church in the nation of the 6,000-plus churches and preaching points in that country.Besides emphasizing home missions to the nation’s 58 distinct tribal groups, the Fellowship has sent and supported missionaries to Niger, Senegal, Mali, Benin, Guinea, and Belgium. In Tanzania the focus is on reaching the nation’s 160 cultural groups and 120 tribes. Its concerted church planting strategy and cross-cultural home missions training have been significant in the fellowship’s growth. In 1980, TAG consisted of 275 churches and preaching points. Today that number has mushroomed to more than 3,200 with at least 100 churches in Dar es Salaam, the capital. Nearly 500,000 adult believers attend AG churches each week. First introduced to Kenya in 1921 and today nearly 3,200 churches and preaching points have been planted around the nation. In Nigeria the church’s growth is said to grow at approximately 400 churches yearly. There are more than 10,000 churches and preaching points, and the Nigerian church is the largest AG fellowship in Africa. The Nigerian AG has been instrumental in the development of the Pentecostal church in Niger. Let us take a look at AG in Eritrea. Soon both Jerry and Maxine Falley were in Eritrea. They say that their primary mission was to work with the un-reached populations-the Afar, Beja, and Rashaida they also knew that without a national link, they could not do what they wanted to do. They established a link with the Full Gospel Church in Eritrea through correspondence, a visit and then by providing for the Church. Falley wrote that the mission had provided half $4500 of the $9000 needed to buy a large tent that was sent to Eritrea for the Church’s use. The balance of $4500 was raised by the local Church members. Falley wrote that the check for payment for the tent was brought from Asmara by an Eritrean American. Falley also writes about the Church in Eritrea and its needs. Two months later, the School of Leadership Training was birthed. A shipping container in the church yard served as a classroom and 21 Eritrean students enrolled for the opening class of the School of Leadership Training. Lois Ohm worked in Eritrea for nearly two years training traditional birth attendants and community health workers as well as presenting the gospel to Muslim women. Ohm no longer works in Eritrea but is still in Africa. Rietkerk has retired and Steve Miller is back in the USA. According to SIM, the KaleHeywetChurch (SIM-related) has planted 11 new churches in 5 years and sent 21 evangelists to “non-Christian and nominally Christian areas of the country[xi]”. Obviously, these groups had no problems “planting churches. If these are legitimate religious groups, why not register them instead of encouraging them to operate “underground”? Allow me to quickly address the issue of the Jehovah Witnesses (JH) in Eritrea as that is another issue that is repeatedly misrepresented by the cartel and the self serving EQL. What the cartel and the EQL conveniently forget to tell their readers is that in the United States, members of the JH have been jailed for refusing to be drafted, during the war. Children were expelled for not pledging allegiance to the flag etc. etc. and parents were jailed for truancy. There is a long and sordid list of court cases filed against and by the JH that show that Americans were not as tolerant of JH as is being claimed today. Between 1933 and 1951 there were 18,866 arrests of American Witnesses and about 1500 cases of mob violence against them. There is a case about JH members being forced to drink castor oil, a strong laxative, to cause their humiliation and degradation. They were labeled “fifth columnists” and more. Attitudes towards JH have not changed; just dampened by an inordinate amount of legislation. The Jehovah Witnesses came to Eritrea in the 1940s. While most of the established religious groups in Eritrea have complied with the various laws, there are some, like the Jehovah Witnesses who have rejected the laws and refused to abide by them. The JH refuse to participate in military service. Main issues which cause criticism of JH in Eritrea and in many other countries across the globe include failed prophecies, blood transfusions, and nationalism. In Eritrea the issue that has brought criticism of JH is their refusal to recognize the Government of Eritrea and refusal to abide by its laws. They also refuse to carry Eritrean identity cards. JH believe that “they owed allegiance to no person, flags, or nation; they owed allegiance only to Jehovah,” therefore, they do not vote, salute the flag, or participate in military duty. The JH refused to participate in the 1993 Eritrean referendum and when the Proclamation on National Service No. 82/1995 of 23 October 1995 which made national service compulsory for all Eritreans between the ages of 18-40 was published, the JH refused to participate in military service. In Eritrea, as in all other countries, a member of any religious group who breaks the law will be punished as any other individual, and cannot invoke obedience to a religious precept as a cause for impunity. No one is punished for the sole fact of belonging to a religious group, as the cartel wants us to believe. A Jehovah’s Witness can be punished if he refuses to do military service in countries where this service is compulsory and no conscientious objection is allowed, although refusing military service is required by his religion. In May 2002, the Government of Eritrea once again called on all religious groups to comply with Proclamation No. 73/1995 and took action against those that did not comply. According to the US State Department the Mehrete Yesus Presbyterian Church, FaithMissionChurch, Seventh-day Adventists, and Baha’i Faith each submitted a complete registration application. The Kalehiwot, Full Gospel, Meserte Kristos, Tinsai, and Philadelphia churches submitted registration packages that did not include individual member names, while the RhemaChurch and others groups reportedly submitted blank registration forms. Yet, the western media and the cartel deliberately and maliciously misrepresented that as being some sort of “persecution of Christians”. They are not victims of “religious persecution”; they are victims of the cartel and their mercenaries who have used them to advance other illicit and dangerous agendas using religious freedom as a pretext. It is very important to understand what religious freedom is, and that it includes in it the freedom not to have one’s religion targeted for destruction. For those who have forgotten Eritrea’s struggle to preserve Eritrea’s cultures, traditions and ethnic and are propagating the cartel’s agenda to disrupt the peaceful coexistence in Eritrea, the destruction wrought in India, Uganda, Kenya, Nigeria and other countries ought to serve as reminders. New Religious Movements (NRMs) have existed throughout history, but the visibility, extent, and variety of have increased dramatically in the last decade. From the United States to Europe, Asia and Africa, nations that have been concerned about the mushrooming of the various NRMs and have instituted some forms of legislation to deal with them. While some registration processes are short, there are some that take years for completion. In African countries where the origins and intentions of a particular group are so hard to determine, especially if they are foreign influenced, the bureaucracy may take years. For instance, in Equatorial Guinea, the Assemblies of God group registered in 1987, but it was not until 1993 that it received official recognition. In Austria the Bundesstelle für Sektenfragen was created by a federal law in 1998. The law defines a sect as a community referring to religious or philosophical beliefs that can endanger the life or the health of persons, their property, or financial autonomy; the free development of human personality; the integrity of family life; and the free mental and physical development of children…The task of the Bundesstelle is to provide “documentation and information about dangers that can emerge from programmes or activities” of these sects. The 2002 law on Religious Freedom and the Position of Churches and Religious Associations created a two-tiered system of registration for religious organizations. To register at the first (lower) tier, a religious group must have at least 300 adult members permanently residing in the country. To register at the second tier, a religious group must have membership, with the requisite signatures, equal to at least 0.1 percent of the country’s population (approximately ten thousand persons). The Government requires religious groups to petition for legal status with the Ministries of Justice and Culture. Legal status gives religious groups the right to act as juridical persons in the court system, secures their standing as officially registered religious groups, and allows them to construct schools and churches. Groups must provide general background information and have at least 100,000 adult adherents to qualify for registration. Persons who wish to form a religious group must register with the Ministry of the Interior. Registration requirements are the same for all religious groups. Religious groups are free from taxation. All organizations, including religious groups, must register with the Government. To register, a group must submit its constitution to the Registrar of Societies section of the Ministry of Labor and Home Affairs. Any person who holds an official position in, manages, or assists in the management of an unregistered organization is liable to a fine of up to $166 (Pula 1,000) and/or up to 7 years in prison. Any member of an unregistered society is liable to penalties including fines up to $83 (Pula 500) and/or up to 3 years in prison. It is illegal for a religious group to operate without official recognition. To register, a religious denomination must legally qualify as a religious congregation. The definition includes “any group of natural persons or corporate bodies whose vocation is divine worship” or “any group of persons living in community in accordance with a religious doctrine.” The President generally follows the recommendation of the Minister and grants authorization by a presidential decree. All religious groups are required to register in this predominantly Muslim country. Religious groups must register with the Government by submitting documentation to the Ministry of Justice detailing the structure and mission of the organization along with a nominal fee. Once approved, a religious group registers formally with the Registrar General’s Office. The Government requires religious organizations to register with the Registrar of Societies at the Ministry of Home Affairs on the mainland and with the Chief Government Registrar on Zanzibar. Religious organizations must have at least 10 followers to register, provide a written Constitution, resumes of their leaders, and a letter of recommendation from their district commissioner. All new nongovernmental organizations (NGOs), including religious organizations, must register with the Ministry of Internal Affairs’ NGO Board. Foreign missionary groups, like foreign NGOs, must register with the Government. Governmental controls require the registration of religious groups. To be eligible for registration, groups must have a unique name; possess a constitution consistent with the country’s laws; and display compatibility with the peace, welfare, and good order of the country. Unregistered religious groups are not allowed to operate. Violators can face a fine and imprisonment for up to 7 years. Hopefully, the Obama Administration will put an end to this impunity by the cartel and its mercenaries and respect the sovereignty and territorial integrity of all nations. The American public should stop giving their hard earned monies to this self serving cartel and think twice before condemning other people’s cultures and traditions. It is about time that the public wake up and see the cartel for what they are…abusive, self centered, greedy and most importantly-UNCHRISTIAN! Eritrea’s centuries long exemplary culture of ethnic and religious tolerance and respect cannot be undermined by modern day missionaries attempting to advance political agendas using “religious freedom” and “religious persecution” as pretexts…. [i] Iraqi exile leader Ahmad Chalabi was one of the most sordid figures in the run-up to the Iraq war. Paid by the Bush administration to muster pre-war intelligence, Chalabi drummed up claims that Saddam Hussein had WMD, helping lead the United States into war. [ii] David Domke, God Willing? Political Fundamentalism in the White House, the ‘War on Terror’, and the Echoing Press. 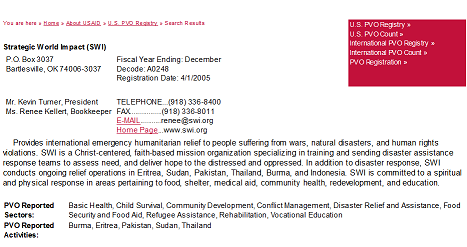 [iii] A yearlong Boston Globe survey showed that 159 faith-based organizations received more than $1.7 billion in USAID prime contracts, grants and agreements from fiscal 2001 to fiscal 2005.